One of the headaches of moving to Mac has been that I have one piece of statistical software that is Windows only. 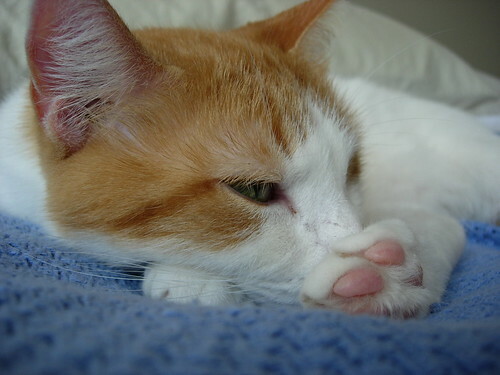 I could abandon the software and learn R, but I didn’t want to do anything rash. 🙂 Besides, at the Midwest, Fred assured me that he was able to get everything to run on his Mac. Armed with optimism and patience, I figured it out. My goal: To run HLM 6 + Stata 10 on my MBP without having a dual boot or full out windows emulator. Random aside: I use these together because Stata will just not estimate complex models with random effects / coefficients. I can get a simple model to run in a few minutes in Stata, but I’ve left a model with 2-3 cross-level interactions run overnight with no convergence. Using HLM 6 + Stata 10 (+ the hlm .ado file), I can use Stata to pass the model to HLM, which then passes the results back to Stata for post-estimation export/analysis. I got it to work once, but since then have had issues getting it to work with new files due to versioning of the stata .dta file. … to Maclandia. We’ve replaced our Linux and Windows pcs with Macbooks. The world is a scary but shiny new place. We also upgraded our NAS to 4 TB. It’s taken me a couple of weekends, but I’ve finally gotten all my files moved, various tools installed, and a full range of backup provisions configured. I’m mainly putting everything down here so that I can remember all the steps for setting up B’s tools and backups and also in the event of harddrive armageddon. When I lived in PClandia, I never backed up my entire OS, based on the philosophy that if something happened to my harddrive and/or OS, I would want to reinstall my entire OS anyway (esp. since Windows tends to get bogged down over time with installs and uninstalls, registry edits, etc.). My old strategy was to back up an exact copy of my user folder (within which all my user profiles, data files, and copies of downloaded software, etc.) to our NAS (RAID 1, 2TB) drive, and then have automatic backups run to a 3TB USB connected drive nightly. I’m still not sure about all the backup lingo, but I essentially had it set up so that the NAS was a mirror copy (including deletions of my pc) but the USB backup would not delete any files but add new copies/modifications to the drive, renaming the old versions of files that had been updated. A couple of things prompted me to rethink this strategy now that I live in Maclandia. First, there’s Time Machine. I understand it can be buggy, so I don’t want to rely on it alone. At the same time, if there were a hardware failure, it would be nice to be able to just reload everything to a new machine (and since Mac OS doesn’t have the bogged down with time/installs problem of Windows – or so I’m told – then I might not want to reinstall everything). This means I wanted to set up TM on the NAS, but also have my data backed up the old way, too. I want my home directory backed up separately in the event that my OS gets corrupted (again, remember, I’ve lived in PClandia for a long time), I can easily reload all my data to a new OS install. I created a user share on my NAS for my TM backups based on these instructions. I had initially used the built in TM features of the NAS, but got a couple of errors (e.g., the TM had problems ‘verifying’ the backup and then would start a new one) when we were trying to back up 2 MBPs to the same TM share. Rather than try to troubleshoot, I figured it might be safer just to keep them in separate NAS shares anyway. [Downside: In my version of NAS firmware, there’s not an option in the user interface to apply a quota to these user shares, though I can see a user quota file in the admin directory that I can probably edit to apply a quota. So, that’s a to-do item.] These TM backups won’t be backed up, since they are the backup. 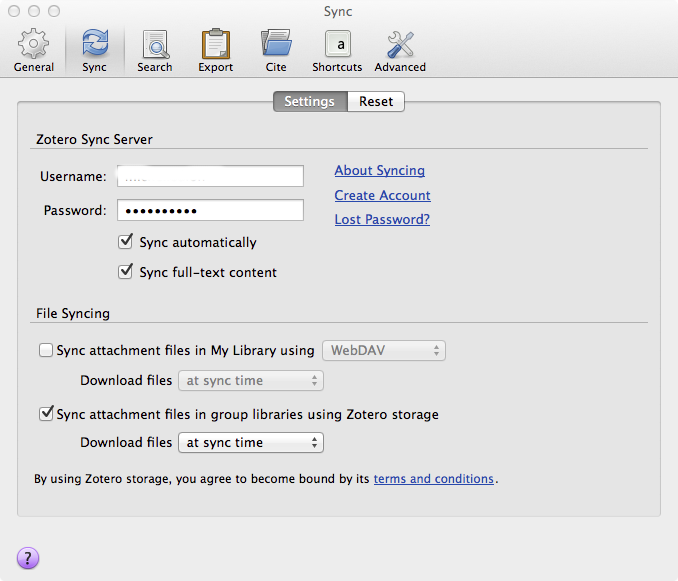 Then, I set up rsync + Automator to backup my user home folder to another NAS share nightly. Right now, I followed these simple instructions. The downside of the simplicity is that it doesn’t create a log file or email me the status of the backup, or errors. It looks like these more complicated instructions would do that, but I think I’m going to see how the simple version works for a bit before tinkering with it. I’m also still using the NAS’s backup tools to do an incremental backup to the USB drive like before. In addition, I want to save my work files offsite and also access them from the iPad. I have two options here: my backups user on Dreamhost (50GB) and/or Dropbox (free 5GB or paid 100GB). 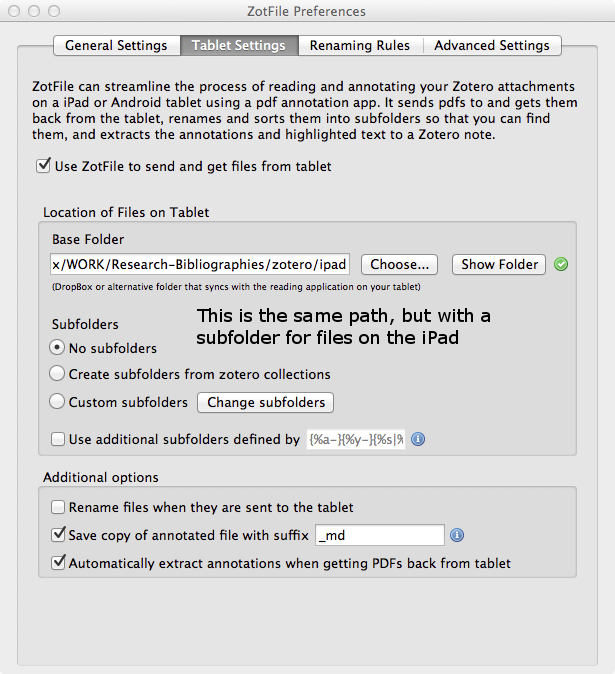 This got a little complicated because I also wanted to integrate Zotero (on MBP) and iAnnotate (on the iPad) into my workflow. 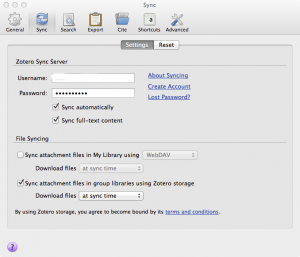 Zotero will only allow you to sync your library using either their service (not enough space) or via WebDAV. My Dreamhost backups storage doesn’t support webDAV. I tinkered around with some options (e.g., storagemadeeasy) to turn either my Dreamhost or my NAS shares into WebDAV folders. But, then, I learned that Mac OS doesn’t play well (or at least easily) with WebDAV, so I abandoned that strategy. Also, though my NAS has an iPad app and related tools to be able to access files remotely (via an encrypted tunnel and using a myCloud app), in practice, they haven’t worked seamlessly or at all. 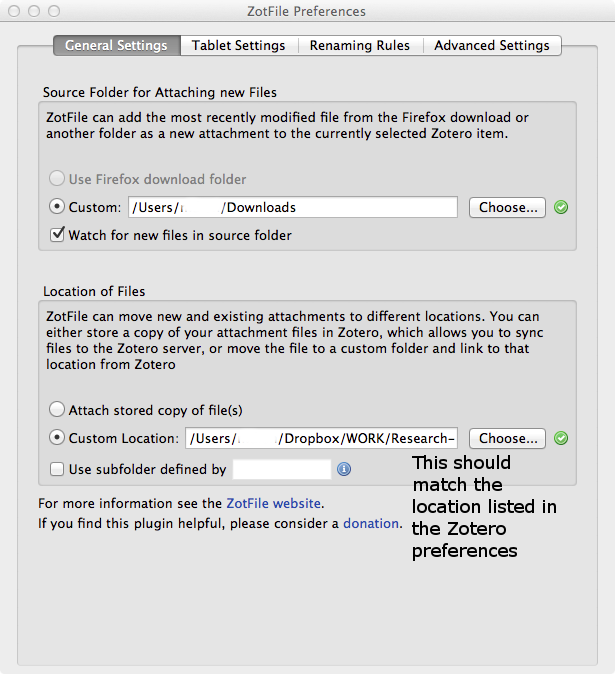 At every turn, it seems that Dropbox was the only solid solution. Since I’m tired of moving files around to not fill up my free space, I’ve resigned myself to paying for Dropbox storage. Seems silly because I have lots of storage at home and 50GB at Dreamhost and I can get them to work together with lots of ad hoc tools and arrangements, but in this instance, I decided that convenience and reliability was more important than cost. Also, I’m really good at rationalizing money spent on technology. 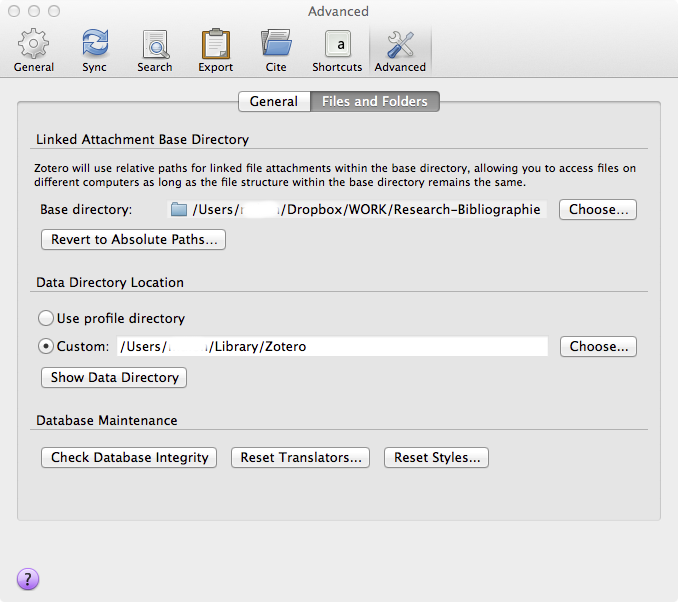 I set up Zotero with my data directory in my home folder, but my document folder in my Dropbox. 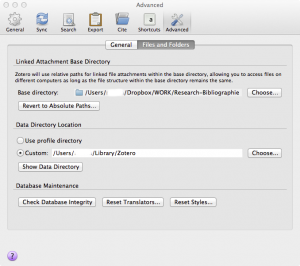 My group library files are synced using the Zotero service. I also have copied these to my personal library as separate collections. I installed the ZotFile plugin to manage the documents. It took some back and forth and tweaking to get the settings right, so I’m going to put them all here for future reference. I figure one way to become more familiar with Emacs is to customize some of its settings. Of the various pages I’ve found on the web that describe different customizations, I’ve found these two to be the most useful. First, I wandered around the Emacs customization menu by clicking the Customize Setup link on the original home screen. There were so many options there that it was a bit overwhelming, even if you browse using the M-x customize-browse command. I did use the menu to “Save for future sessions,” which created a virtually empty .emacs file for me. I figured that way the file would be saved in the correct place (i.e., my home directory). Next, I thought I’d browse the options for changing the color scheme. These instructions were the most helpful for installation. Once installed, I typed M-x color-theme-select and then clicked/RET on the different themes until I found one I liked. Not too complicated. Seems you can customize your own theme using this tool, too. I poked around online and found several examples of .emacs.el or init.el files. 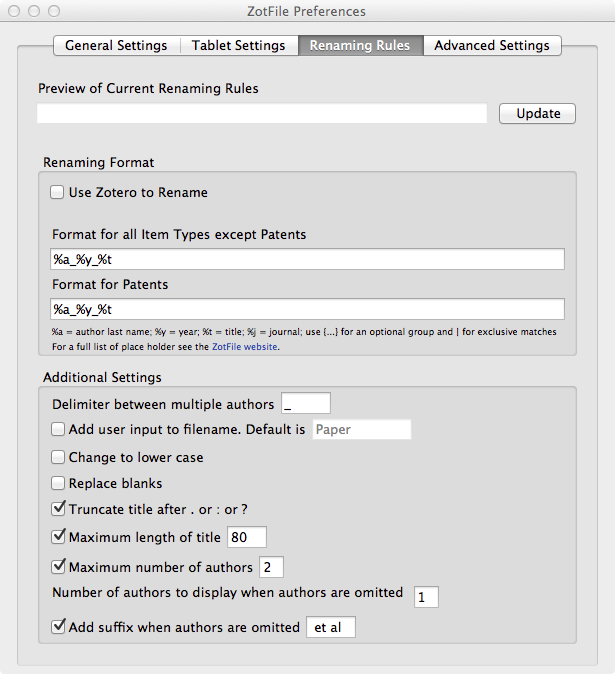 (Seems like it’s a “thing” to post your Emacs customizations online…. kind of like the equivalent of a g33k bicep flex.) I also read more about the pros/cons of Emacs vs. WinEdt. It seems like one of the big cons of Emacs for Windows users is that several of the keyboard shortcuts and/or default behaviors are so different in Emacs that it creates problems if you’re moving back and forth across tools. Sure, you could customize Emacs to get rid of some of those annoying default behaviors, but, boy, does that seem like a lot of work. And, while it’s easy in linux to install packages from the command line, in Windows it’s a several step process. So, while I am confident I could learn to use Emacs, and maybe it really would be transformative and change my life forever, but I think I’m going to be more pragmatic and move on to WinEdt for now. Updated to add: FWIW, I’ve saved the most useful pages about setting up Emacs on Windows to my delicious.